After their opening two games when they couldn’t score a goal for love nor money, Thornton Hibs finally found their shooting boots and went to town when Whitburn came visiting. And yet they suffered a terrible start to the game when with only three minutes played Reece Duncan rifled home a low drive from the edge of the area. The visitors could only hold on to this lead for two minutes before Shaun Keatings’ ridiculous shot from just inside his opponents’ half fairly whistled into the net just below the crossbar. By the ninth minute the Hibs led 2-1 with Keatings sending in a great cross that was perfect for Andy Adam to smash goalwards. Daniel Russell made a fine save but he could only parry the ball into the path of Daniel McNab who headed into the empty net. Chris Ireland’s volley made it 3-1 in the 18th minute before Andy Adam completed the first-half scoring with a tremendous 35-yard drive that sailed into the top corner of the net. 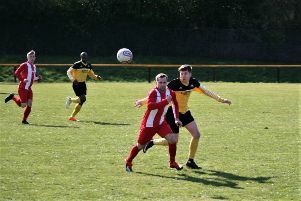 Whitburn were reduced to ten men in the 57th minute when their captain, Gary Brass, was ordered off for a second yellow card offence and rather than be a hindrance this appeared to help his team-mates as they went on to enjoy their best spell in the game, with Darren Tomaszewski reducing the leeway in the 75th minute with a well-struck free-kick. The final word though went to Nathan Kiristino who got on the end of Scott Orrock’s lay-off in the 84th minute to secure the victory that meant that the Hibs jumped from second bottom to seventh in the East Superleague. Thornton Hibs: Linton, S.Drummond, Millar, Orrock, Shanks, Adam, Keatings, Hepburn, Ireland, McNab, Anthony. Subs: McMillan, Shields, Crichton, Coleman, Kiristino. Whitburn: Russell, Forrest, Tomaszewski, Hamilton, Boyle, Nicol, Thomson, Henderson, Brass, Liddell, Duncan. Subs: B.Docherty, G.Gunn, R.Gunn, J.Docherty, Wilsdon.